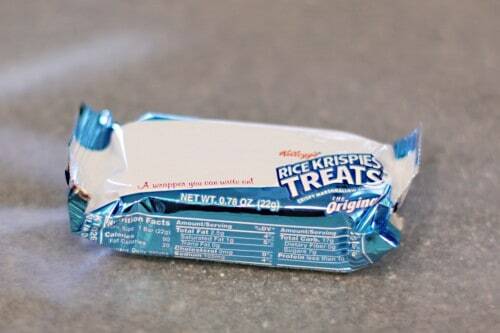 One of my favorite food items to dress up are Rice Krispies Treats. 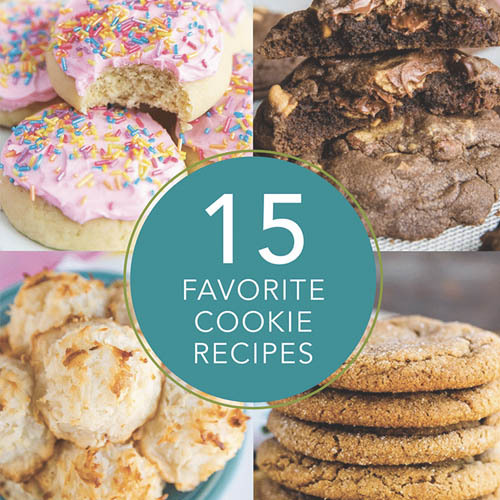 They are really versatile and if you are in a hurry there’s no need to make a batch, just open a box (though flavor wise my heart belongs to the homemade ones). 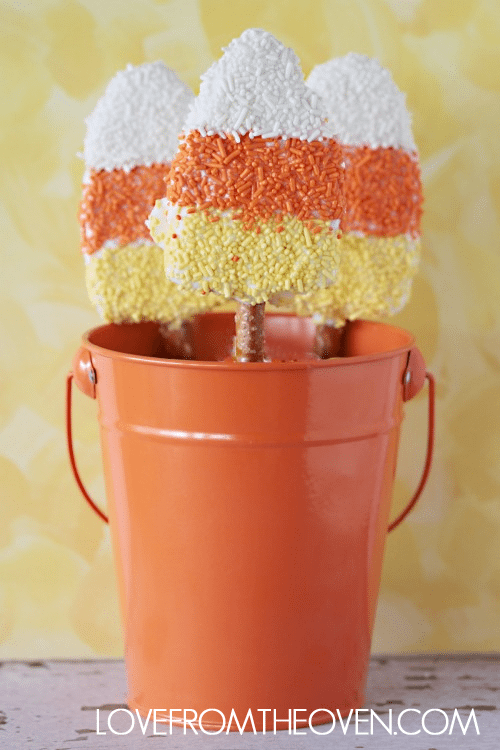 Here’s a fun little Halloween Rice Krispy Treat for you. 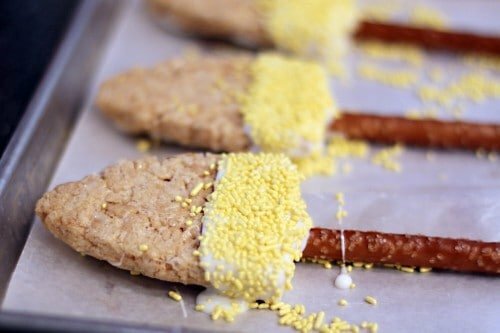 You need… Rice Krispy Treats, Pretzel Rods, White Chocolate (such as Wiltons) and sprinkles. 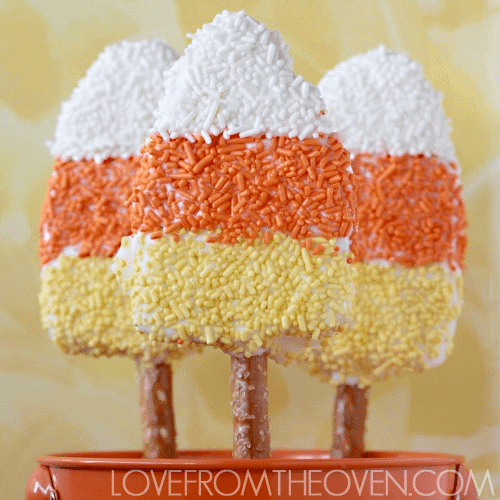 Unwrap your Rice Krispies Treat and shape it into something that somewhat resembles a piece of candy corn. 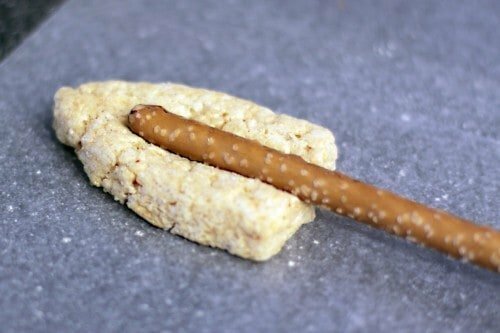 Then gently press a pretzel rod into it in order to create an impression where you will want to put the pretzel rod. 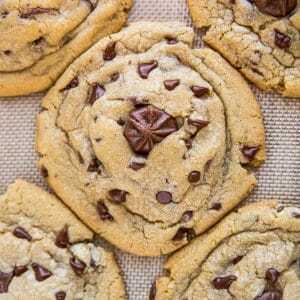 Melt your chocolate, then fill the pretzel impression with chocolate. Put the pretzel back in, and cover with more chocolate. 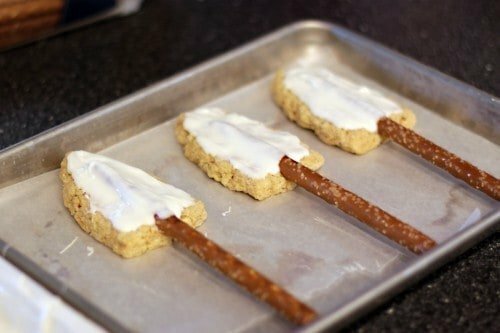 The goal is to get the pretzel rod to stay firmly attached to the krispy treat, so be generous with the chocolate. You need to hold the pretzel still for a minute or two to make sure it doesn’t pop right out of the chocolate. 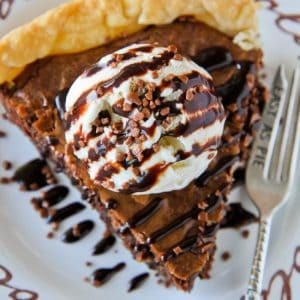 At this point I popped mine in the freezer to a few minutes to speed up the process of the chocolate setting. 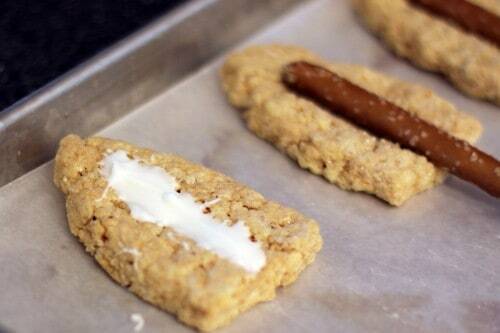 After the chocolate is set, you are ready to coat the entire rice krispy treat in chocolate. 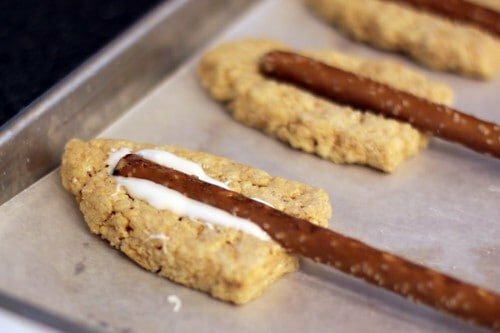 Be careful, as the pretzel rod could pop off (it’s far more secure after you dip the entire treat in chocolate and it sets). I did my chocolate in sections, allowing me to separate the sprinkle colors. I spooned my chocolate on, over the bowl I had melted my chocolate in. I let each stripe of chocolate and sprinkle set up before I moved on to the next color. 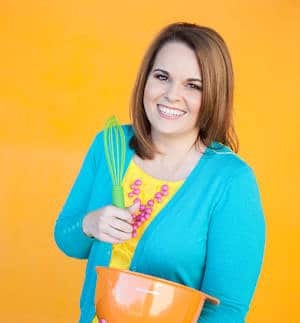 Once you have covered the entire krispy treat (front and back – though I did not put sprinkles on the back, you certainly could), let the chocolate set until firm. 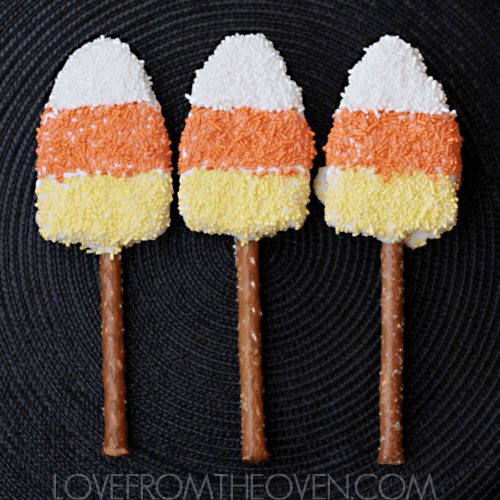 And now you have a super cute Candy Corn Krispy Treat for Halloween! 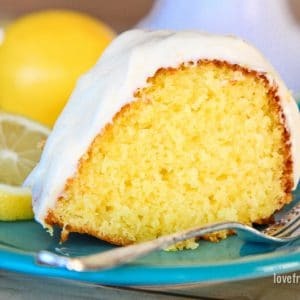 These would be really cute with cellophane bags over the top and some holiday ribbon tied on, especially if you are taking them somewhere or handing them out as favors. 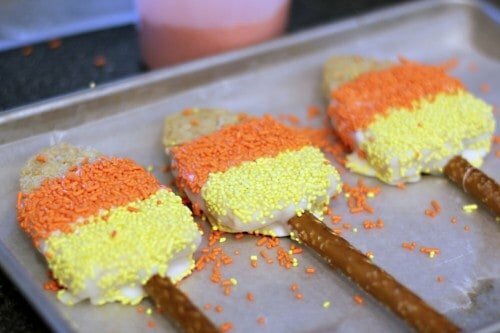 For more fun candy corn inspired recipes check out the Candy Corn Bites From Other Blogs. 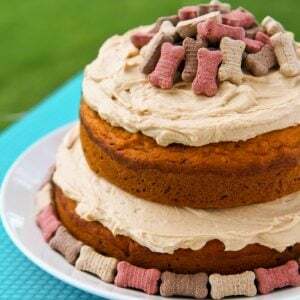 And if you are looking for more fun ways to use Rice Krispies Treats, check here! What a fun idea! Thanks so much for sharing. You are so creative! What a great idea and so simple to execute as well. I bet everyone loved them! These are so dang cute! 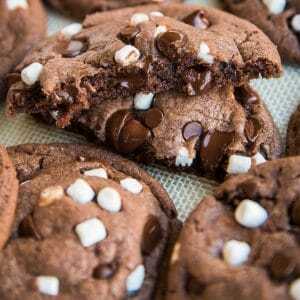 My kids would love them!!! These pops are getting me so excited for Halloween, adorable! 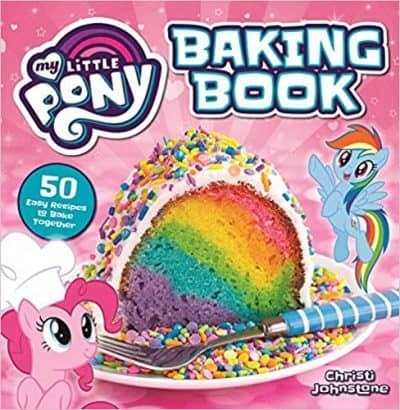 Now this is just pure fun to both make and eat. Very creative goodies. These are so, so wonderful! I’m visiting by way of your feature over at SITS today! So happy to find you and follow you here! 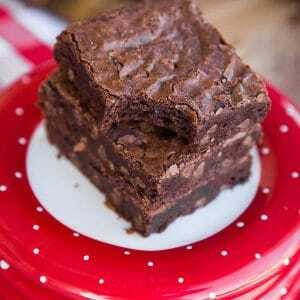 I always enjoy your posts over at Tip Junkie! I’m definitely giving this post and pin and a plug! cool!!! and looks relatively quick to do!! Thanks for the ABC tip…love them!! !